One of the Kitchener 1916 project’s challenges is perspective. I read early 20th-century newspaper articles and try to turn off my early 21st Century sensibilities. While it’s not always possible, I think it’s important that I’m aware of my biases and experiences—“lenses,” if you will—when reviewing the accounts of the day. I don’t know when hobbies and interests became aggrandized to “passion projects,” but here we are. I’ve noodled a new food writing project for a while. One specifically about Canadian food—not what’s found in glossy magazines, not fashionable eating hitched to celebrities, fads and marketing schemes—but actual foods prepared in actual kitchens. It’s pretty easy to become myopic and follow herd mentalities around the normalcy of “local eating,” “clean eating,” and CSAs. It's also just as easy to assume faddish foods and ingredients such as coconut oil, slow coffee, and bone broth are the centre of the everyone’s kitchen (or worse, any kitchen that doesn’t tout them is somehow a lesser space than a kitchen that does). Then, my thoughts meandered to my backyard. Here, in Waterloo Region, we are known as both a German and a Mennonite community—but that’s only part of who we are. Half claim German or British backgrounds, but the balance arrives from the rest of the world: the Caribbean, Central America, China, Eastern Europe, India, Portugal, Southeast Asia, West Africa, (etc.). Several projects address current food culture or have cooked through historic local cookery books—and they are fabulous. I’m interested in how we got to where we are. How the land influenced people and food. The waves of new and different cultures. The evolution of our food and drink industry. To me, understanding a people’s challenges, time and opportunities are essential to understanding that people’s food. So after more noodling, Rye and Ginger was born. Why call it Rye and Ginger? Rye for Waterloo Region's distilling and brewing history. Ginger for both local indigenous wild foods and the influx of immigration. Apart from the Great War, Pancho Villa, Shackleton and Rasputin, 1916 was also a year of suffragettes, prohibition and high-speed rail. 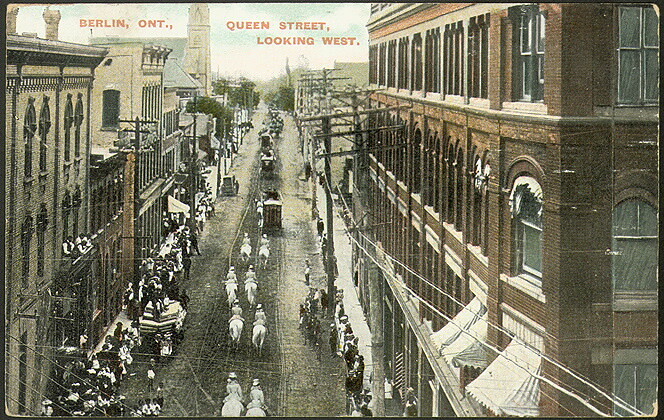 Just as important, 1916 was the year Berlin, Ontario changed its name to Kitchener, and swirling up around it were local intrigues. Shakespearian. But then again, which era isn’t? Each week I’ll upload a summary of that’ week in 1916’s happenings, bringing in food-related issues whenever I can--topics related to cost of living, the market, prohibition, etc. Each post will end with a recipe—period, if I can muster it, with a modern equivalent to help readers and home cooks get by those quick ovens and egg-sized lumps of butter. Afterwards, I hope to expand the project to explore our area’s food history, from native culture to the Queen’s Bush Settlement to the various mills, abattoirs and distilleries that were part of area’s economy. I will always need a space for my cathartic pensée-à-pixel foodish diarisation. And I will continue to haphazardly post my thoughts and real-life adventures here on Cardamom Addict. Some cross-pollination will happen but given the very different natures of these sites, I don’t expect there to be a lot of overlap.